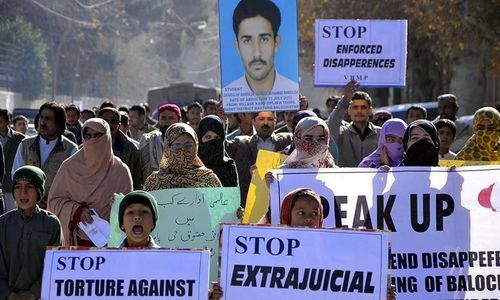 The Supreme Court (SC) on Thursday called for a detailed report on all 'missing' persons held at all government facilities as it started hearing an application filed by the chairperson of the Defence of Human Rights organisation, Amina Janjua. A two-judge bench headed by Justice Ejaz Afzal Khan ordered the interior ministry to provide a detailed account of everyone being held and their crimes. "Why have these people been held without any charges filed against them," questioned Justice Khan. "If someone has committed a crime, they should be punished after trial." He added that the interior ministry's report should explain why people have been held captive for years without any trial proceedings against them. Janjua — who was representing missing persons — presented her own report regarding the issue to the apex court. 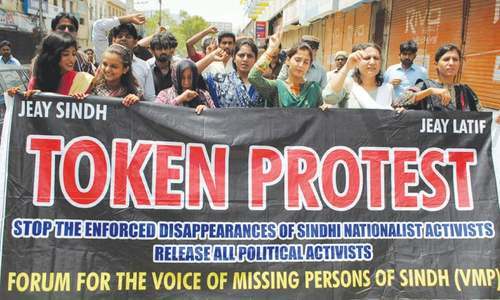 According to the report, the Inquiry Commission for Missing Persons received 4,229 cases since March, 2011. From there, the report said, the commission has so far wrapped up 2,939 cases. However, Janjua claimed before that people are still being forcefully abducted. "The highest judicial office of the country has no answer to give to the loved ones of the missing persons who have been doing the rounds of the courts in search of their loved ones for years, " Justice Khan observed. The bench ordered that all persons held in detention centres should be allowed to meet their relatives within a week. The hearing was subsequently adjourned until November 13. Issue of missing persons are an old many times and many men raised voice on this even approached the honorable apex court of the country but of no avail. this issue must be solved and the concerned department must be directed to show the arrest of abducted men by registering cases against them instead of hiding. Any subject of interest to the intelligence and security agencies should be tried according to the law of the land and constitution of Pakistan. We have to come out of the security state mentality and progress towards a welfare state based on basic human rights, freedom of expression and right to live. The supreme court and others must ensure that the rule of law is upheld without exception and no one should be allowed to violate the human rights of any citizen of Pakistan under any excuse, including in the name of State Security. The practice of forced disappearance is not giving a good signal about the image of our country and it's institutions neither inside nor to the outside world. @Shazia its fake...it has also been written many times. All for nothing, the agencies involved are above the law!